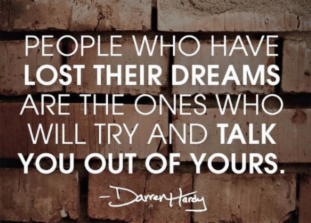 "People Who Have Lost Their Dreams Are The Ones Who Will Try And Talk You Out Of Yours." We MUST be very careful about who we choose to take advice from in our lives...If they have not built or created what you are looking to create, then we should not listen to them. Stay focused, keep pushing and go create the life you truly want and deserve!